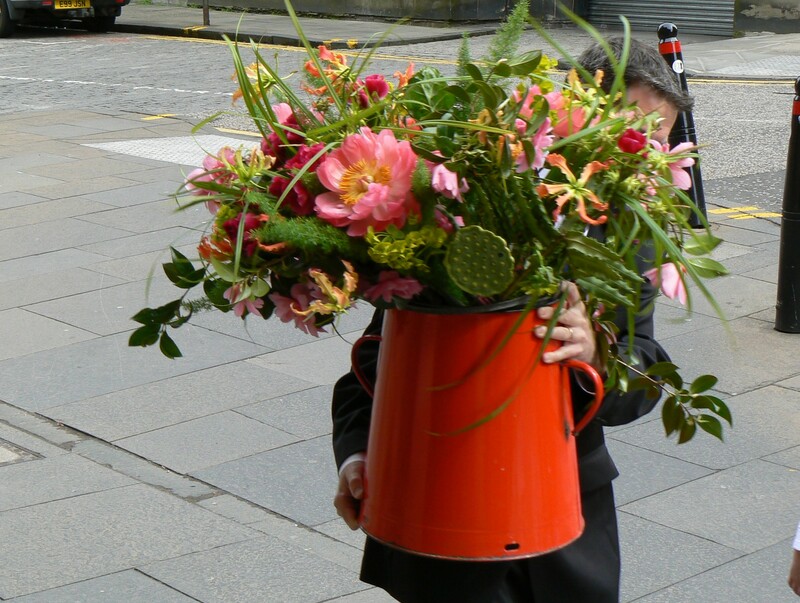 Monica is a florist in Edinburgh concentrating on life's occasions; wedding flowers, celebrations and events. My Patty’s Plum poppies are flowering already and make a very good cut flower. There are buds galore in a east facing border amongst peonies, digitalis, cirsium, geum and fennel, all looking strong with buds plumping up awaiting their turn to flower. Yet is was the Turk’s-cap lilies with their spectacular purple speckled markings and nodding bell heads that were the starting point for this bouquet. In theory I tend to stay away from yellow as it can be too hard on the eye preferring the more gentle way of lemon flowers but this is an exception and when mixed with pink and silver greys it can look very beautiful. Delicate peonies, astrantia major and double aquilegias self seeded from my neighbours garden make up the other flowers. Kale seed pods, pittospernum, eleagnus augustifolia and the dark moody actaea purpurea make up the foliages. It has been so mild of late that all the bulbs I bought in Holland last Autumn are very nearly all in full bloom and the garden is just bursting with colour and promise. 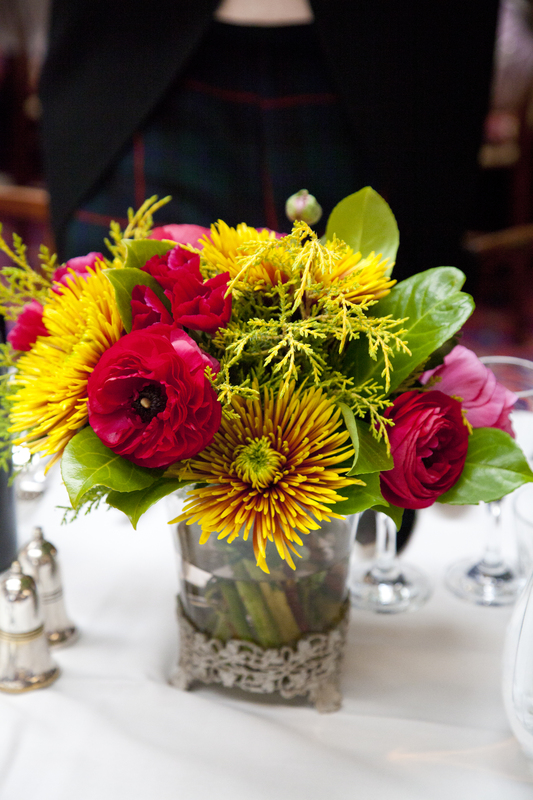 This and the fact that last month’s bouquet was cool in colour made me wish for a colourful combination. The zesty chartreuse green of euphorbia seemed to beckon from under our Acer as did the pretty bluebells and anemones. In a few of the shadier corners of the garden I found the poppies and forget-me-knots; such simple but evocative flowers. There is a sprig of lemon hellebore and some fronds from the kale that has gone to seed, along with fennel, chard and geranium for movement and scent. The tulips are Queen of the Night and Blue Diamond – which is meant to be a late variety but has turned up early! Our Rhododendrons are in bud but showing colour so perhaps next month I will get to incorporate some bigger blooms, in the mean time I hope you enjoy the fresh lively green and lime tones of spring. I had a request for a rose laden scented bouquet the other day and began to remanice about the garden roses I used to get from a local market grower who has long since retired. Then I recalled the occasions that I had the chance to order roses from David Austin and knew this was another of those wonderful opportunities. My client hoped for a bouquet that was heavy with scent and abundant with blousy roses. Herbs from the garden, a tangle of flowering jasmine and David Austin roses, Miranda and Keira were tussled into place with the Dutch rose Amnesia for a little mocha tone. Later I added some pieris from the garden to add to the vintage atmosphere and soaked up the early summer scent. This month’s petit bouquet turns out to be white and green primarily due to a strong urge to incorporate the flowers of the somewhat maligned pieris shrub which I love. I think it is the perfect spring wedding ingredient and would look even more decadent en mass in an urn arrangement with pewter and grey tones. I’ve been admiring the pieris blossoms as the month has progressed and been looking forward to working with them. They have such a beautiful cascading manner and their tone is akin to porcelain, that and the way they evoke lily of the valley makes the pieris a wonderful spring flower to cut from the garden. I have combined these with the beautiful helleborus niger, white tulips, verigated myrtle, a sprig of young bamboo, passion flower foliage, ferns and if you look closely, some delicate snowdrops. Ideally the tulips should be further open but the mornings have been so cold of late that my tulips are still very tight in bud. Perhaps next month will herald rhododendron blooms and fatter tulip heads. I do hope so. Now that a few bulbs are braving their heads I wondered if I could put together a seasonal bouquet with elements from the garden. I had a wander round and collected these gorgeous hellebores, some sprouting fennel fronds, the odd fern, evergreen grass, rhododendron buds, hyacinths and myrtle. I had to sear the hellebores to get them to hold up but it is very easy to do. Just boil the kettle in advance of cutting the stems and when off the boil for five minutes pop the stems in a few inches of the hot water for another five minutes and then transfer them into cold water for ten minutes before you use them. If the water is too hot it will turn the stems to mush, so do be vigilant. Another element I added were the old fashioned flowers primula obconica, which I love and have as a house plant. Primula are always the first to appear in the garden but the stems were too short for this bouquet and the mottled tones of these were just right for the atmosphere I had in mind. The simple cowslip would have been just as pretty if you have it. A rummage through my ribbon drawer for this velvet touch and an old terracotta pot transformed it into a table decoration for tonight’s dinner guests. I plan to do a bouquet from the garden every month now so we can see what is possible from our plot and monitor what is appearing as the warmer months arrive. I can’t wait for the pieris to come into flower perhaps even next month as it has been so mild. It is a beautiful wedding bouquet ingredient. I found these pretty hair combs and circlets recently and have been enjoying their simple beauty. The delicacy of the honey and champagne tones make them perfect for weddings and the waxed flowers are just lovely to see as is the fine threading and wiring. The flowers remind me of forget-me-knots, lily of the valley and paperwhites; the flowers of late spring. They inspired me to see what I had squirreled away in the studio that might lend itself to being wired into a circlet and remembered my gum nuts and dried seed pods. I found some eucalyptus leaves and a length of vintage lace that once wired together made this atmospheric hair piece. Finally after an early frost I decided to inject a little antique white to the palate. I love making one-off hair decorations particularly with fresh flowers and herbs yet sometimes the dried elements have a completely different atmosphere; sun bleached and frozen in time that is just as valid. Holly, skimmia, moss, lichen and lonicera made up the bulk of my wreath this year, much of it collected from the garden. The holly can really lacerate your hands so do wear gloves if you are making your own. I wanted to keep it simple and the little dried gourds give just the right splash of warmth to it. Its always such a wonderful thing to work with moss and I particularly like the scent of it. Next to putting up the tree, making a wreath for the front door marks the lead up to Christmas and all the fun family gatherings ahead. I recently hosted a mini flower road show in and around Edinburgh to showcase some of my work to some old and new friends in the trade. I had collected some beautiful moss and lichen clad branches on a recent trip west and had a hankering for some gentle roses to contrast with the texture of these. Here are my beautiful raw materials before I started arranging them. The change in the seasons also really affected my longing to hang onto the delicacy of summer so when I saw the marguerite daisies with their lilac and deep pink tones I knew they had the perfect atmosphere to combine with the fennel, curry plant, passion flower and verbera bonariensis picked from the garden. The basket was the perfect way for me to transport the table decorations. This is the season for the marvellous kalanchoe succulents that deepen in tone as they soak up the late autumn sun. These combined with tropical leaves, seasonal spider chrysanthamums, pretty muted hydrangea, roses and lichen branches made for a wonderful textural arrangement that was still soft in its palate and form yet had a sense of place and the season. At last I have some photos of the flowers to share with you care of our kind friends. We got married in The Edinburgh Suite of the Registry Office overlooking St Giles Cathedral with wonderful light flooding the room. Jamie’s cousin piped us down the Mound to The glorious New Club for drinks on the terrace followed by a delicious meal, speeches and dancing late into the night. Fiona and the band members of Corra had everyone on the floor all night and were kind enough to let our talented friend do a number with them. The New Club really is unique; the architecture, the views, the contrast between the thoughtful modern extroverted design and the intimacy of the dining room allow for a very relaxed way of being. There is something very special about being able to move between wonderful spaces with friends and family whilst socialising and dining. The spaces punctuate the occasion in a very subtle but significant way and The New Club does this spectacularly. It made the day for us. 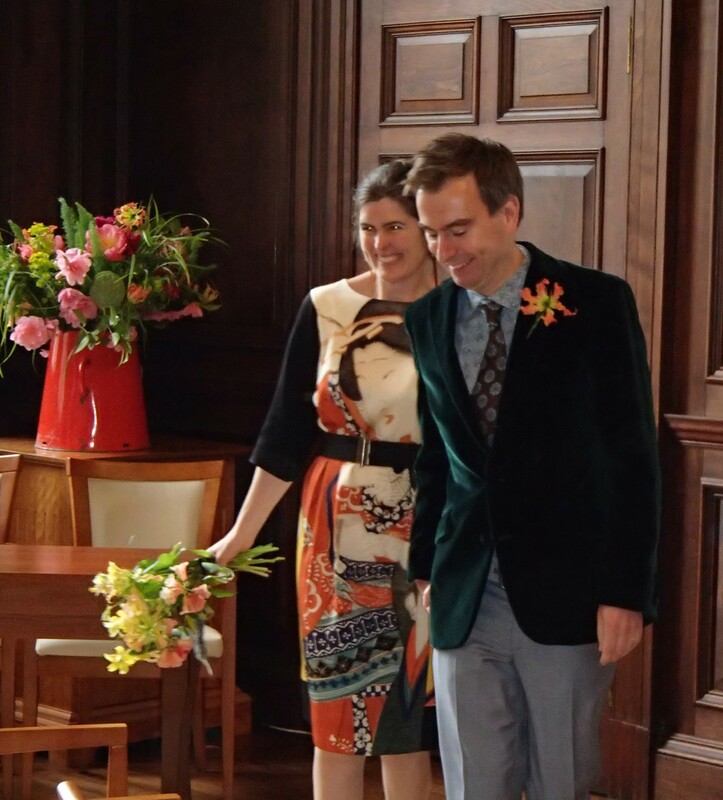 As I was wearing a dress with a strong print and colour, I didn’t want the bouquet to compete so I took a tone from the dress and kept the bouquet simple in its hues. I also wanted it to be delicate and have an air of the season. 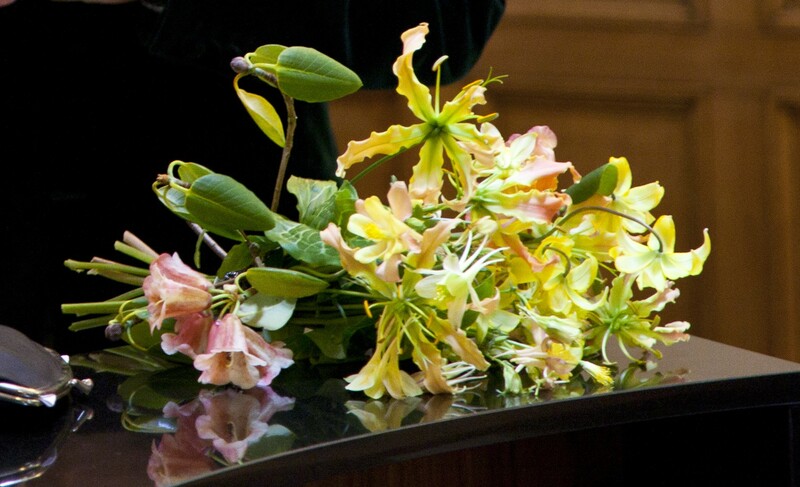 Fortunately the late spring conspired to provide such delicacies as the pale lemon columbine, the delightful erythronium – also known as Dog’s tooth violet, pretty petit rhododendron and the honeysuckle-esq gloriosa lily. I arranged these the night before and bound them with the atmospheric ribbon that my talented friend Isla had so beautifully made with our initials embroidered in beads. We love bright colour so we chose coral and pink tones with lively acid green for The New Club. 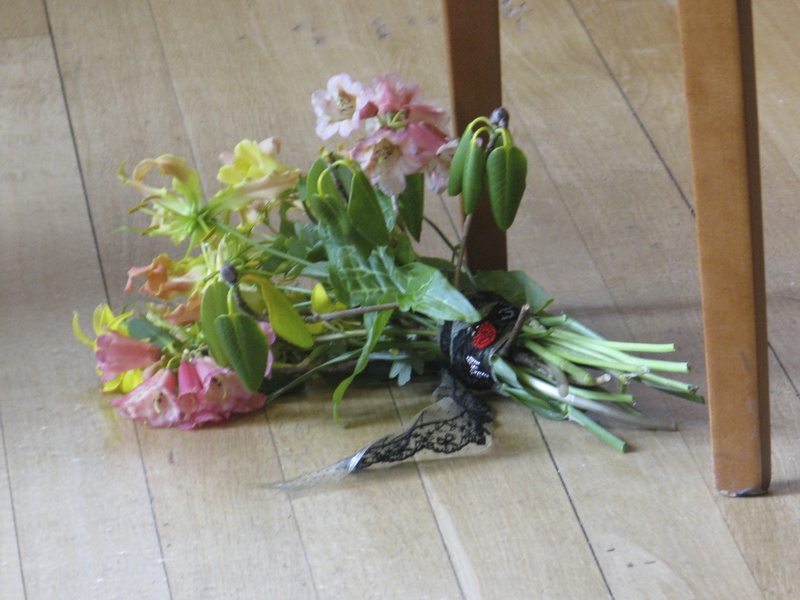 Peonies, gloriosa lilies, godetia, lotus pods, poppy seed heads, euphorbia, asparagus and the most decadent of cascading camellias made up the arrangements. 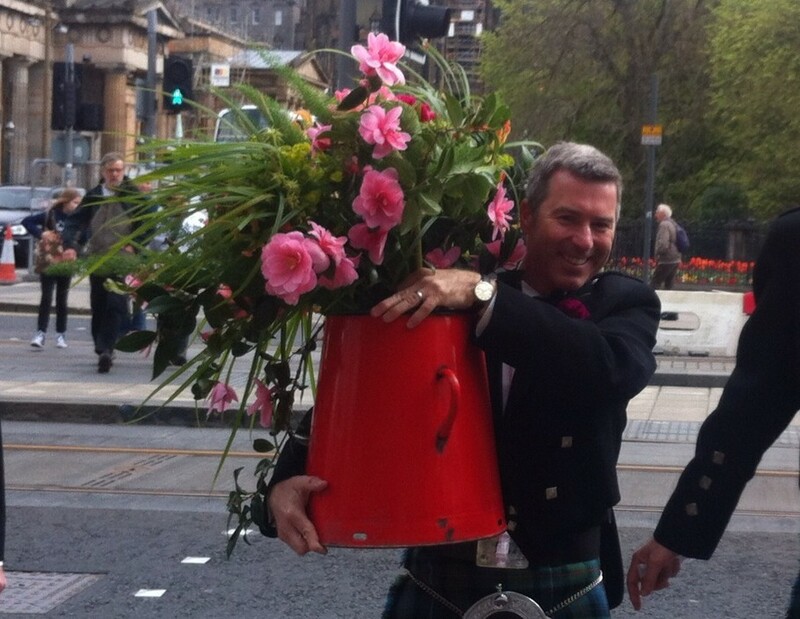 Our sporting ushers brought the flowers down the hill to The New Club. 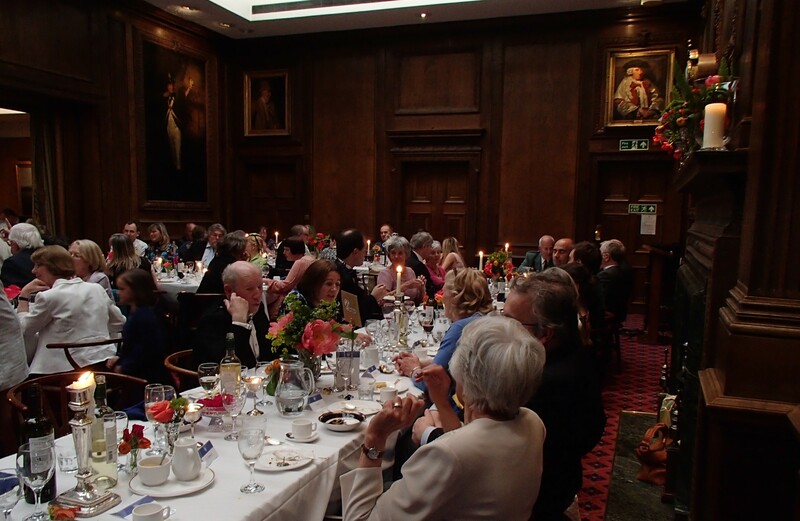 After drinks on the fantastic terrace with the backdrop of the castle we moved to the elegant oak panelled dining room for a delicious meal and hilarious speeches. 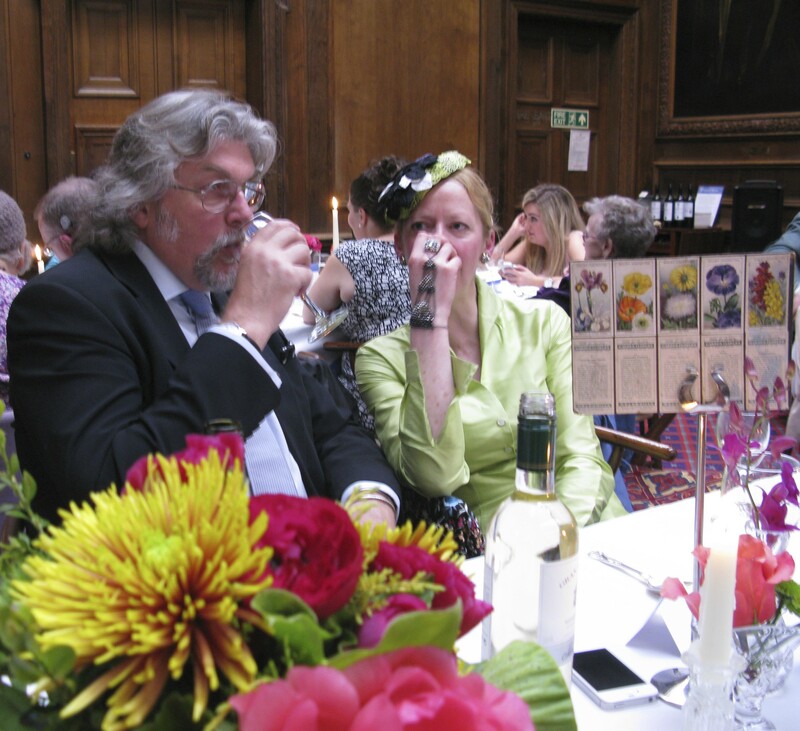 Each of the tables had a combination of crystal vases and candlesticks of various sizes with bunches of exotic flowers mingled with more delicate stems. I found these pretty cigarette cards that we used as our table name cards. Plum and Hamish were a delight to work with as Plum had a very strong sense of the colour scheme she wanted. From memory, the inspiration came from an Indian textile they had bought on one of their travels. Jewel tones with hints of chartreuse. Wonderful. 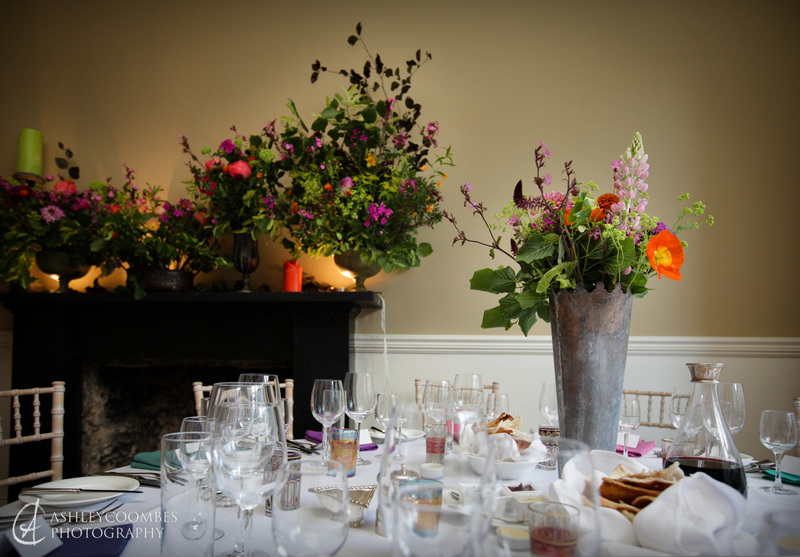 The flower atmosphere was to be relaxed and I had great fun sourcing the delicate poppies, lupins and ragged robin to give a wild feel to the flower combinations. 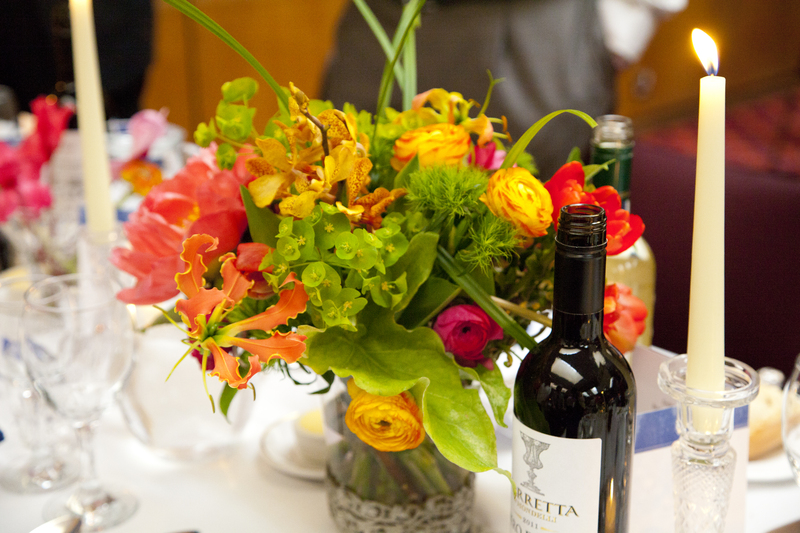 The mottled patina of the Indian vessels I found were the perfect foil for the vibrancy of the flowers and gave just enough height to elevate them slightly on the tables but not too much. Peonies, monbretia, zinnias, sandersonia, viburnum opulus, euphorbia and copper beech were combined to give the fireplace arrangement a more lyrical shape. I have been germinating sweet peas, delphinium, cortusa, dianthus, amni and bupleurum ready to harden off in a couple of months. The peonies I put in last year are poking their heads through and the fennel has taken off - no doubt due to the lashings of zoo manure applied last autumn. Once the temperature rises a little I have seeds galore to plant up and all going well, this will be the first year of cutting beautiful home grown flowers for wedding bouquets.